Its that time of the year again! My old convector heater broke and this is the cheapest convector I could find. 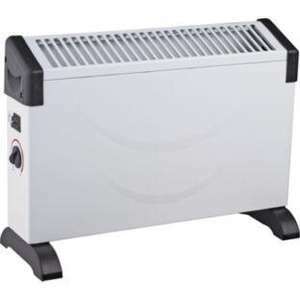 Was £19.99 Now £14.99 This heater gets 5 stars reviews on Argos so it looks like a brilliant buy for the money. I picked up mine today and I actually received the CHALLENGE 2kW CONVECTOR HEATER WITH TIMER which costs £29.99! Your mileage may vary. Think of all the energy wasted transferring from heat to electricity, then through the national grid then back to heat again in your house. Thanks, tempted to get one now. I used one of these when the heating went down in my old house, the don't half run away with the electric . Just found out you can get 75p Quidco if you reserve and collect by tomorrow! I used one of these when the heating went down in my old house, the don't … I used one of these when the heating went down in my old house, the don't half run away with the electric . have to agree - we used one a few years back to heat our porch (about 15' by 6') we ran it for a month and it increased our electricity bill by well over one hundred pounds - it's now gathering dust in the garage! I used one of these last year when I was living in a house where the landlord had the heating controls locked away, thankfully I wasn't paying the electric bill. hot price.. but electricity bills will be shocking !! I have this, its great. Voted HOT (excuse the pun). I have it in one of ours rooms that doesnt have a radiator! Good stuff, i have this for 2 years and working as new. I constantly use it to heat a 3x3m room, takes no time to warm it up. Morrisons have a 2kw convector heater for £15 if its closer. What is a better alternative to these in terms of saving on electric bills? I have radiators in my house, but during winter still need a backup source in a couple of the room - I've experienced extortionate electric bills over winter periods so would prefer something that fairs better whilst still providing some decent heat. Just went to pick up mine earlier. They actually gave me the CHALLENGE 2kW CONVECTOR HEATER WITH TIMER which costs £29.99! I didn't even notice it until I just unpacked it just now! All for £14.99 - 75p Quidco = £14.24!! these dont half use a lot of juice...considering the electric and gas prices are rocketing up...i dont use my delonghi...its in the shed gathering dust...fcuking rip off barstewards these energy companies.. Anyone got one today? And did they give you the more expensive £29.99 Challenge 2kW Convector heater with timer instead like what I got? What is a better alternative to these in terms of saving on electric … What is a better alternative to these in terms of saving on electric bills?I have radiators in my house, but during winter still need a backup source in a couple of the room - I've experienced extortionate electric bills over winter periods so would prefer something that fairs better whilst still providing some decent heat. Extra jumpers? Are you talking about rooms you spend a lot of time in or somewhere like a dining room or bedroom which could be heated with an electric heater for a short while before you use it? Gas Central Heating. Electricity will always be the most expensive form of heating, because in the UK we have to first buy another fuel such as Gas or Oil to burn in order to produce Electricity and so there are four middlemen who want to profit - the gas supplier, the power station, the national grid, and your Electricity supplier. So if you are looking for a cheap to run Electric heater, there isn't one. Personally, I use a Japanese manufactured indoor 3kw paraffin inverter heater as an alternative to All Electric Heating. I run it on domestic 28 second Kerosene (Heating Oil) and it costs around 6.2p / kw to run which compares well against 11p - 12p / kw for electricity. At £200 its probably too expensive to qualify for a Hot Deal, so I wont link to any suppliers or start a thread, however you can find them for around £150 delivered from Italy on Ebay (EU Search). I used mine last Winter as an alternative to a 3.0kw convector and it went a long way to paying for itself, just from what it saved me over the Winter months in Electricity. They are extremely safe with loads of safety cut outs and even a built in co2 sensor and are probably far safer to use than portable calor gas heaters, and they don't suffer from the same condensation problems as bottled gas heaters. If you don't like the idea of using these inverter heaters then consider some kind of 'personal' heater, such as an Electrically heated throw, to wrap around you (uses around 100 watts), and pray for a mild winter. I got the timer version of this last year, was about £23 then, which I thought would be a good idea as on Economy 7 to build up some heat overnight, and it was an excellent heater, although obviously like all convectors expensive to run.The main problem was the timer didn't work properly, even a replacement was very hit & miss, so too be honest you're better with this non timer model, and then just buy a seperate 24hour timer which you can buy in most places for about £3. We don't have gas, only Economy 7 Storage heaters, although have only kept one of these due to their size, but have found it quite hard to replace them with something that works well and doesn't cost a fortune to run.I always used Halogen heaters in our static as they were cheap to buy, and use as low wattage, and OK for instant or background heat, but like fan heaters aren't really powerful enough to build up much heat for house.Convectors work well as are usually 2kw or more, but of course expensive to run.Of the cheaper portable heaters I've settled on oil filled radiators, but all have their pro's and cons, and with the price of electricity mostly cons! The timer is there to use but I find it more convenient to just manually adjust the temperature control since I use it next to me in my study. So far so good. Its more sturdy than the one I purchased more than 7 years ago from Argos. Very good buy for the money. Anyone else managed to get a heater with timer when they picked it up from Argos? The missus alright with that, is she ?